Wooden Ben Franklins Black Prince White Sails Pirate Ship Model 15"
Wooden Black Barts Royal Fortune Model Pirate Ship 20"
Wooden Henry Averys Fancy White Sails Pirate Ship Model 20"
Thomas Tews Amity Pirate Ship in a Glass Bottle 7"
Wooden Henry Averys Fancy White Sails Limited Model Pirate Ship 26"
Wooden Blackbeards Queen Annes Revenge White Sails Model Pirate Ship 7"
Wooden Amerigo Vespucci Tall Model Ship 15"
Wooden Thomas Tews Amity White Sails Limited Model Pirate Ship 26"
Wooden Calico Jacks The William Black Sails Limited Model Pirate Ship 26"
Wooden Captain Kidds Adventure Galley Model Pirate Ship 7"
Wooden Blackbeards Queen Annes Revenge Model Pirate Ship 20"
Wooden Star of India Tall Model Ship 15"
Wooden Captain Kidds Black Falcon White Sails Limited Model Pirate Ship 26"
Wooden USS Constitution Tall Model Ship Magnet 4"
Wooden John Halseys Charles White Sails Pirate Ship Model 15"
Wooden Caribbean Pirate Ship Model Magnet 4"
Wooden Ed Lows Rose Pink White Sails Pirate Ship Model 20"
Historically accurate features bedeck these museum-quality Limited Edition scale replica tall ship models of the Sovereign of the Seas, which are built with the finest craftsmanship and attention to detail. As the crown jewel and grandest warship in the fleet of England’s King Charles I, this fighting tall ship of the line occupies a distinguished place in British naval history. Now her Limited Edition tall ship model may similarly occupy a proud position in your office, home or meeting room from which to display her exquisite beauty. Numerous additional deck details such as cannon balls, barrels, rope coils, cleats, etc. NOTE: All models now have a natural wood hull below waterline. The white has been discontinued. Our Sovereign of the Seas stands above all others in terms of craftsmanship and authenticity. Look at all the stern details of the model. 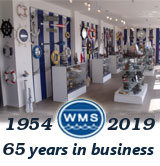 Add this museum quality handcrafted model ship to your life today! HMS Sovereign of the Seas was a 90-gun (later 100) first rate ship of the line of the English Royal Navy. She was later renamed Sovereign, and then Royal Sovereign. The ship was launched on October 13, 1637 and served from 1638 until 1696, when a fire burned the ship to the waterline at Chatham, England. HMS Sovereign of the Seas was built by Peter Pett (later a Commissioner of the Navy), under the guidance of his father Phineas, the king's master shipwright, and was launched at Woolwich dockyard on October 13, 1637. 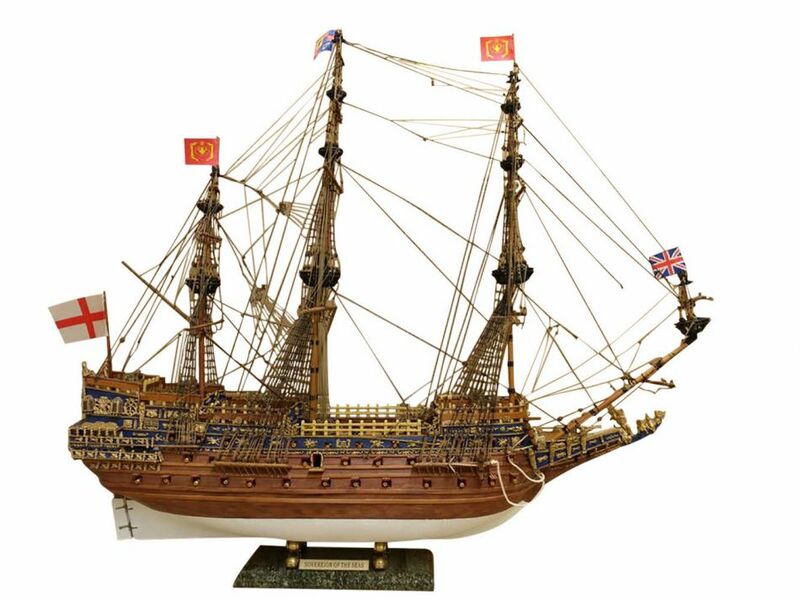 As the second three-decked first-rate (the first three-decker being Prince Royal of 1610), she was the predecessor of Nelson's Victory, although Revenge, built in 1577 by Mathew Baker, was the inspiration providing the innovation of a single deck devoted entirely to broadside guns. She was the most extravagantly decorated warship in the Royal Navy, completely adorned from stern to bow with gilded carvings against a black background, and the money spent making her, £65,586, helped to create the financial crisis for Charles I that contributed to the English Civil War. Charles had imposed a special tax, the 'Ship Money', to make possible such large naval expenditure. The gilding alone cost £6,691, which in those days was the price of an average warship. She carried 102 bronze cannon (King Charles explicitly ordered such a high number) and was thereby at the time the most powerfully armed ship in the world. Until 1655, she was also exceptionally large for an English vessel; no other ships of Charles were heavier than the Prince Royal. The Sovereign of the Seas was not so much built because of tactical considerations, but as a deliberate attempt to bolster the reputation of the English crown. Her name was in itself a political statement as Charles tried to revive the perceived ancient right of the English kings to be recognised as the 'lords of the seas.' English ships demanded that other ships strike their flags in salute, even in foreign ports. Rear-Admiral Sir William Symonds noted that after the ship's launch she was "cut down" and made a safe and fast ship. Referred to as 'The Golden Devil' (den Gulden Duvel) by the Dutch, Sovereign, as she was named after 1651, when she was again made more manoeuvrable by reducing the number of cannon, served throughout the wars of the Commonwealth of England and became the flagship of Admiral Robert Blake. She was involved in all of the great English naval conflicts fought against the United Provinces and France. When, during the First Anglo-Dutch War, on October 21, 1652 the States-General of the Netherlands in a secret session determined the reward money for the crews of fireships that succeeded in destroying an enemy vessel, the Sovereign was singled out: an extra price of 3000 guilders was promised 'in case they should ruin the ship named the Sovereign'. Although repeatedly occupied by the Dutch in the fiercest of engagements the Sovereign was retaken every time and remained in service for nearly sixty years as the best ship in the English fleet. After the English Restoration she was rebuilt as two-decker with flatter gundecks and renamed Royal Sovereign. She was smaller than Naseby (later renamed Royal Charles), but she was in regular service during the three Anglo-Dutch Wars, surviving the Raid on the Medway in 1667 by being elsewhere at the time, and took part in the outset of the War of the Grand Alliance against Louis XIV of France, participating in the Battle of Beachy Head (1690) and the Battle of La Hougue, when she was more than 50 years old. In that period she was the first ship in history that flew royals above her topgallant sails. Sovereign became leaky and defective with age during the reign of William III, and was laid up at Chatham, ignominiously ending her days, on January 27, 1696, by being burnt to the water line as a result of having been set on fire either by accident, negligence or design. In her honour, Naval tradition has kept the name of this ship afloat, and several other subsequent ships have been named HMS Royal Sovereign.